To see Bill talk about his book, you can go to YouTube (talk 1, talk 2). To learn how to use the dictionary, see Bill's video here. 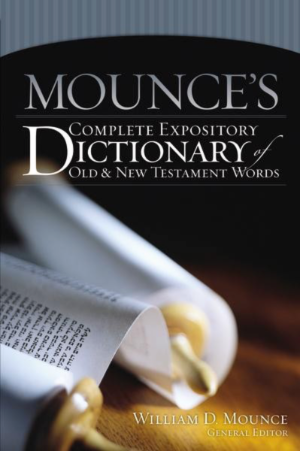 You can purchase Mounce's Complete Expository Dictionary of Old and New Testament Words from your local bookstore, online from ChristianBook.com, or electronically inside Accordance, OliveTree, or Logos. You can download pdfs of the front matter and a few sample pages on the entry for "Love"
For years, Vine's Expository Dictionary has been the standard word study tool for pastors and laypeople. However, the years of scholarship since Vine's was published have shed extensive new light on the use of biblical Greek and Hebrew, creating the need for a new, more accurate dictionary of Bible words. This new expository dictionary, edited by William Mounce, is ideal for those with little or no knowledge of Greek or Hebrew who want greater insight into the meaning of biblical words to enhance their Bible study. It is also the perfect reference for busy pastors needing to quickly get at the heart of a word's meaning without wading through more technical studies. This dictionary: contains accurate, in-depth definitions based on the best of modern evangelical scholarship; is keyed to several translations, ranging from the KJV to present-day translations; each English entry discusses both Old Testament (Hebrew) and New Testament (Greek) words (as applicable); uses both Strong's and G/K numbering systems. The G/K numbers ties in Mounce's Expository Dictionary with many of the best study tools. Disclaimer: I edited this book. When Zondervan came to me and asked if I would edit this book, I was skeptical at first. I am not much for reinventing the wheel. But the longer I preached, and the longer I looked into what was currently available at the lay and pastoral level, the more I became convinced that the book was worth the effort. John Piper says in one of his books that people "hang onto words." He is right. Words are very important to us. We spend much of our Bible study time thinking about them. And they are the vehicle (along with grammar) that God chose to reveal most of himself to us. This dictionary is designed to help the layperson and busy pastor get quickly to the meaning of a word as well as the basic idea conveyed by the word and associated words in general. The main part of the dictionary covers all the most important words in the Bible, which are arranged by English word order. There is also a short Greek and Hebrew dictionary that covers even more words with shorter definitions. I am sure I am biased, but this is really a good book, it avoids many of the errors of similar books (like thinking the root parts of a word still reflect the word's meaning), isn't tied to just one translation, and gives you just the information you will need, in the majority of situations.